I see here human evolution taking off in a new, hopefully more promising direction. This entry was posted in Prophecy - oracles - seers - mystery schools - cloud readings, Soul purpose - Soul mission - Soul evolution and tagged cloud readings, human evolution, prophecies on 29 January 2018 by Alice B. Clagett. 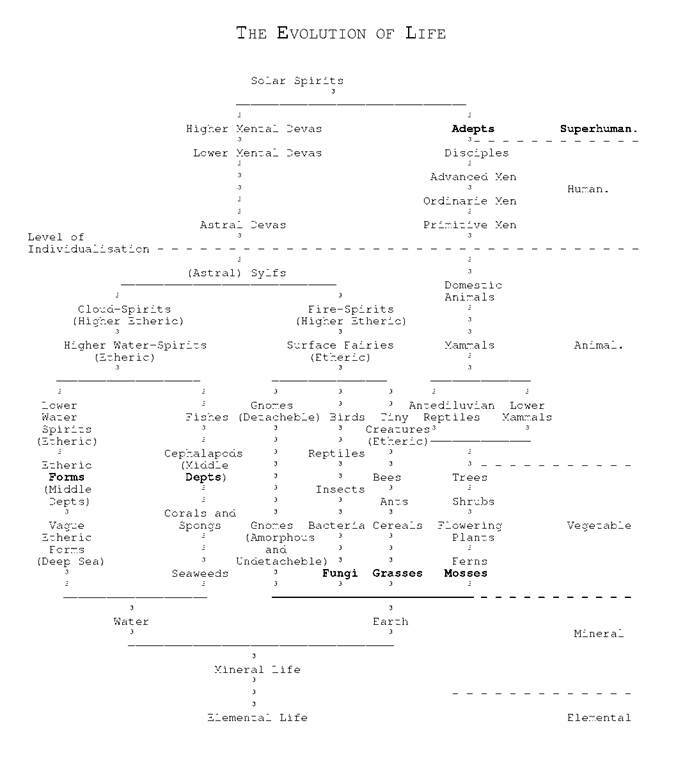 Here is a Table on “The Evolution of Life” from page 44 of Arthur E. Powell’s book “The Solar System.” It gives a general notion how the devic kingdom (in the astral realm) and the human kingdom (in the physical and astral realms) are side-by-side evolving. Link: “The Solar System,” by Lieut.-Colonel Arthur E. Powell, 1930, available at www.amazon.com … Table: “The Evolution of Life,” p. 44 … http://minhtrietmoi.org/Theosophy/Powell/The%20Solar%20System_files/image019.jpg ..
You can see Sylphs (spelled ‘Sylfs’ in the chart) just below the level of individualization in the devic realm. I don’t see Cherubim and Seraphim on the chart, but from what I’ve read they are individualized, so they must be among the Astral Devas indicated on the chart. For a Sylph, the process of aligning with a human through baptism into Christ Consciousness (1) can result in a great leap of evolution, into the higher devic realm. And for the human who cherishes his or her association with the Baptismal Sylph, a great evolutionary jump into higher Christ Consciousness can result. This is not the only way in which the devic kingdom cooperates with the human kingdom, for indeed, no life would exist on Earth were it not for the efforts of the elementals, which create and nourish not only our own human bodies, but also all plants, animals, and mineral beings on our beautiful planet. Link: The chart “The Evolution of Life,” in “The Solar System” by Lieut.-Colonel Arthur E. Powell, page 44, https://books.google.com/books?id=e08IU-M5YKUC&lpg=PP1&dq=%22Solar%20System%22%20arthur%20powell&pg=PA44#v=onepage&q=%22Solar%20System%22%20arthur%20powell&f=false .. This book is available at Google Books and at Amazon.com ..
(1) See “Baptism and Sign of the Cross to Protect the Heart” by Alice B. Clagett, http://wp.me/p2Rkym-7NM .. This entry was posted in Buddhic or Christ consciousness, Christianity, Devas - nature spirits - nature elementals, Myths of creation, School of Theosophy, Solar events - geostorms, Stories - myths - visions - legends and tagged Arthur E Powell, Arthur Powell, baptism, Buddhic consciousness, Christ consciousness, CMEs, coronal mass ejections, devas, devic evolution, devic kingdom, elementals, human evolution, human kingdom, individualization, myths, Myths of creation, School of Theosophy, solar events, solar flares, stories, sylphs, Theosophical Society on 10 October 2017 by Alice B. Clagett. For those that are into the sci fi story about the Martian bacteria that colonize the human GI tract … In my version of the story, there are ‘good’ and ‘bad’ Martians, which is to say, those who are of service to the All, and those who are service to self. We humans can expect fruitful cooperative alliances with the former, whereas through diet and appropriate eliminative techniques, we may hope to optimize the numbers of the latter that occupy the ‘space stations’ that we call our physical bodies. My understanding is that the bacteria we find out on their own in the world, which don’t form colonies such as those found within mammals, are the ‘Ancient Ones’ of the Martian species collectively termed, here on Earth, ‘the Elder Race’. The Ancient Ones of these peoples were here on Earth before humankind, and were subject to the perils of predation by insects, spiders, and other beings. Thus the advisability of finding a safer ecological niche, such as within a mammalian GI tract, circulatory system (whether blood of lymph), or in some cases less beneficial to the mammal, the muscle or nervous system. In the view of the colonists, the Ancient Ones are the pioneers, the very brave ones, whose existence might be cut off at any time by one slash of the razor teeth of that fierce and loathsome being, the Ant. To be truthful, up close and personal, I see ants in the same light. 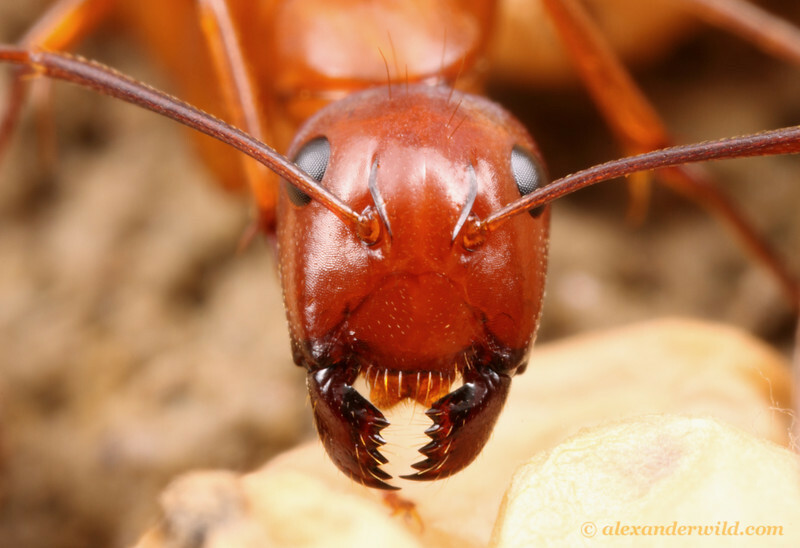 Image: Jaws of an Ant … https://photos.smugmug.com/Ants/Taxonomic-List-of-Ant-Genera/Camponotus/i-T8nzJ22/2/L/castaneus2-L.jpg .. 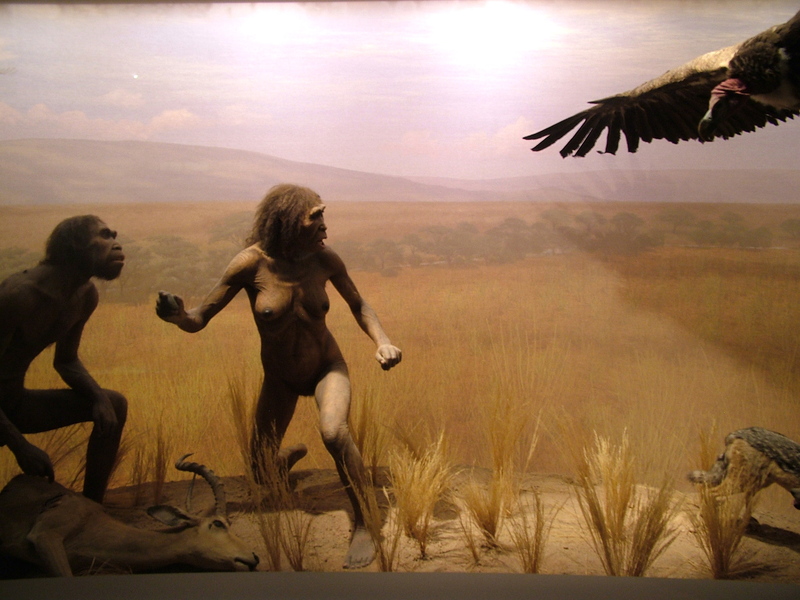 Image: Early humans Fight Giant Bird for Prey … https://paulxwillis.files.wordpress.com/2012/04/dscf6177.jpg .. 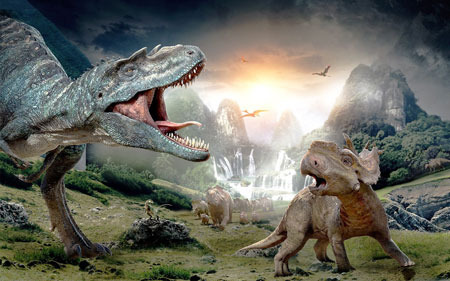 Image: Big Gorgosaurus attacks little Pachyrhinosaurus from Kidzworld … http://s3.amazonaws.com/kidzworld_photo/images/20131217/a9bc1c07-3d8c-4a2b-b8d1-9ac478d171d2/gorgosaurus-attack.jpg ..
For those Martian colonies that have established ‘space stations’ on human beings’ bodies, perils are predictable. Daily elimination culls many members of their colonies. Lack of bonding with individuals, together with quick formation of deep friendships, makes up for this. In addition, there is a social memory complex (1), just as there is for humankind. In an attempt to understand the complex adaptive behaviors of ants and bees, our science calls this animal instinct. But in the case of the Martian bacterial colonies in humans, it is much more than this. For these colonies, bathed as they are in the astral matter of humankind, have developed, in synch with us, a greater notion of the All, which is imprinted in their social-memory-complex. 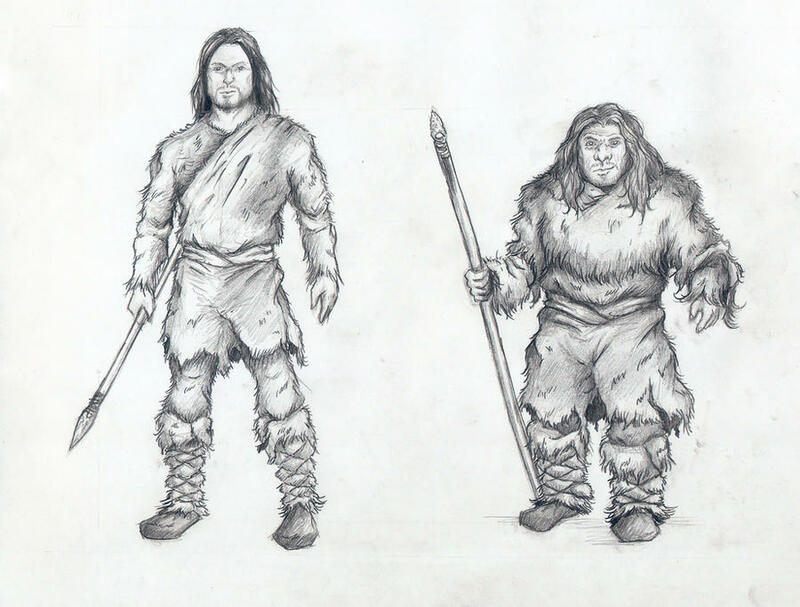 Image: Cro-Magnon (left) and Neantherthal man (right) by Mihin89 … http://img02.deviantart.net/1d92/i/2011/117/5/2/cro_magnon_and_neanderthal_by_mihin89-d3f16wa.jpg .. In a physical sense, this instantaneous continuity of social memory might be explained thus: As bacteria reproduce asexually, through a fission (cloning) process (3), the offspring has the same DNA as the parent. Thus, why might it not have the same social memory as the parent? Might not parent and child, having the same genetic makeup exactly, be considered the same organism? Thus, for a highly advanced species of Martians, who serve the All, and colonize the human GI tract as benevolent allies of the human body, the daily loss of many members of the colony through the process of elimination might be held philosophically as the loss of some portion of one’s ‘other selves’, these being also oneself, who remains alive. Human Sexual Dimorphism Leads Us to Forget the All. In this sense, the human differentiation into sexual dimorphism might be seen as a digression or dissimulation that leads our species astray from the truth of the All. Benevolent Martian bacteria might be seen as having the eternal Truth close at hand from asexual birth to asexual rebirth. As to the ability of Martian (bacterial) colonies within our human form to communicate with us, the answer is: Yes, they can do this through telepathy. However, unless we first optimize our human vehicle through diet, eliminative techniques, pure water, and exercise, we will contact our Martian warrior foes rather than our Martian allies. Looked at from an asexual reproductive standpoint, where all bacteria with a common ancestor are viewed as one Martian individual, there may be only a handful of Martians, whether ‘good’ or ‘bad’ in any one human body, and these might be the voices purporting to be representatives of our Martian colonies that are heard from time to time on the astral plane. The lifespan of bacteria varies by type of bacterium. Some live only a few minutes or a few hours. Others live for a few years. (5) Some, trapped in a dormant state in rock salt, have been revived after 250 million years, according to the BBC. (6). Bacterial Dormancy and Space Travel. The ability of bacteria to survive for such a long time in a dormant state may allow them to become space travelers. In point of fact, NASA proposes that this may be the case, and that the sort of alien beings found in a meteorite in 2011 might be related to the giant bacterium Titanospirillum velox. (7) Well then, could it be that a race of Martian giants are those who are the space travel contingent of what may be a very diverse group of beings whose life line originated on Mars? Bacteria That Consume Radiation and Space Travel, Both Martian and Human. Bacteria specialized as space travelers might also have the ability to eat radiation (8). This would facilitate interstellar explorations and possible colonization in other star systems. This method of space exploration is an elegant solution, as it utilizes systems already in place … such as the expectable movements of meteor showers and comets … for dispersal, rather than requiring internally produced fuel, such as rocket fuel, which is easily exhausted. 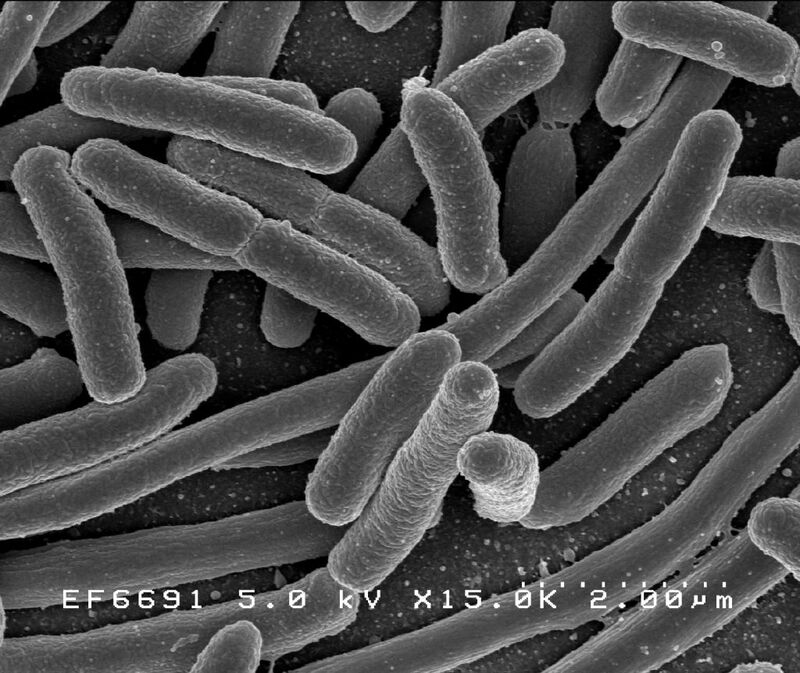 Image: Cylindrical E. Coli Bacteria, from Wikimedia … https://upload.wikimedia.org/wikipedia/commons/3/32/EscherichiaColi_NIAID.jpg .. Image Chain structures resembling bacteria found on the surface of the ALH84001 meteorite using SEM, MicrobeWiki – Kenyon College … http://blogs.discovery.com/.a/6a00d8341bf67c53ef0120a6e2dbba970b-800wi .. There are talks about using the newly discovered cosmic-ray-eating bacteria to feed astronauts, or possibly to be genetically added to the human DNA, to allow human space exploration. I request that the rights of Martians, as an alien species allied to us, be considered as part of the experimental design process. This planet has but two principles in design and purpose: These are, the All, and Free Will. Let us not war on our allies, let us not attempt to control them, but rather to honor their Free Will in this decision-making process. Image: Hominoid Iterations, from Evolution-Involution, adapted from National Geographic … http://evolution-involution.org/bipedal_hominoid_hominid_alt.jpg .. 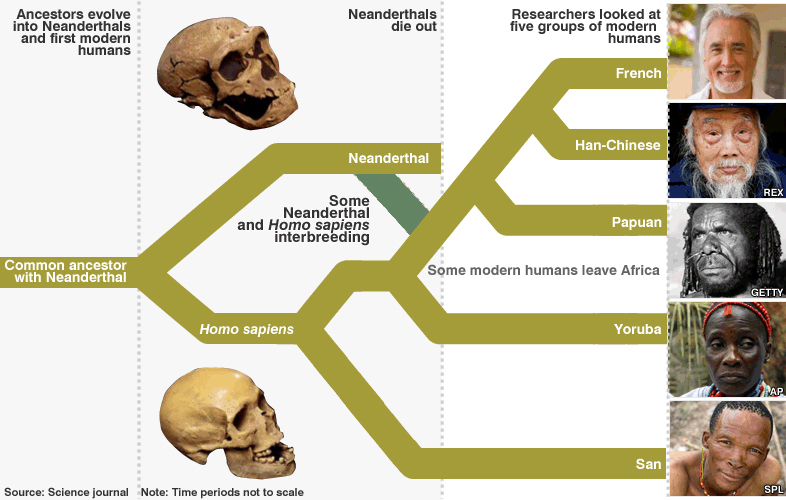 Image: Neanderthal Evolutionary Line and Their Gene Commingling with Human Evolutionary Line, from Science Journal … http://www.starshipnivan.com/blog/wp-content/uploads/2010/05/Human-cousins.jpg ..
For those who take this sci fi story to heart, and begin to consider whether it may or may not be true, the prospect of being a colony rather than a discrete individual may be a little daunting. This is because we of the Western world pride ourselves on our individuality, and prize, over all, our physical bodies. As we place our awareness, on our individual self and our physical body, rather than on our social-memory-complex as a species, and our Souls and subtle bodies, we get, as it were, stuck in the ‘material rut’. We see no farther than ourselves. Now suddenly, our ‘self’ becomes our ‘many selves’. Our world view crashes headlong into this greater reality: We are one, and we are the All. This is true even within our own physical bodies. It is true in the greater reality of the social memory complex of our species, jostled as it is by the many social memory complexes of the All. In our telepathic talks with our Martian colonist allies, who do their best to keep their home, our physical bodies, in perfect working order, let us exercise diplomacy in the same way that they do. Let us treat them with the highest respect, as they do us. In this way our life on Earth will become more harmonious. If there is a catastrophic war, say a world war, what will happen? Many human bodies will die, so there will be far less human bodies to colonize. This can’t be good, can it? There will be disruptions in food supply, so there will be little to eat. So, in the humans that remain, there will be little excrement. This can’t be good, can it? In this way I would speak to the Martians who are ‘service to self’, for the sake of the greater good, the All. Link: “Compendium of the Martian Archives: Bacterial Colonists of Earth,” by Alice B. Clagett, 9 July 2017, updated … http://wp.me/p2Rkym-7sz ..
Link: “Dark Night of the Soul … Slave Planet Blues!” by Alice B. Clagett, revised 9 July 2017; reposted from 7 July 2015 … https://wp.me/p2Rkym-6sa ..
Link: “Sentient Germs?! Bacteria from Mars?” by Alice B. Clagett, revised 9 July 2017; reposted from 21 April 2015 … https://wp.me/p2Rkym-6sl ..
(1) For more on social memory complexes, see Link: “The Law of One: The Ra Material” … 11.17 or http://www.lawofone.info/results.php?q=social+memory+complex ..
(2) Ayla was a Cro-Magnon woman who was raised by Neanderthals. See Link: “Ayla (Earth’s Children)” in Wikipedia … https://en.wikipedia.org/wiki/Ayla_(Earth’s_Children) ..
(3) See LInk: “Fission (biology)” in Wikipedia … https://en.wikipedia.org/wiki/Fission_(biology) ..
(5) See LInk: the post by Karthikeyan Ramalingam · B. S. Abdur Rahman University Oct 24, 2012, in ResearchGate … https://www.researchgate.net/post/What_is_the_average_life_span_of_a_bacteria ..
(6) See Link: “Alive…After 250 Million Years,” in BBC News, 18 October 2000 … http://news.bbc.co.uk/2/hi/sci/tech/978774.stm ..
(7) See Link: “NASA Scientist ‘Finds Alien Fossils on Meteorite’,” updated 6 March 2011, 4:48 pm … http://www.abc.net.au/news/2011-03-07/nasa-scientist-finds-alien-fossils-on-meteorite/1969084 ..
(8) See LInk: “Radiation Eaters,” by the National Science Foundation … https://www.nsf.gov/news/special_reports/microbes/textonly/eaters.jsp ..
(9) See also LInk: “Timeline of Human Evolution,” in Wikipedia … https://en.wikipedia.org/wiki/Timeline_of_human_evolution ..
(10) For more on this, search ‘mobile group II introns’ in Link: “Complex Life Traced to Ancient Gene Parasites,” by Brandon Keim, 9 June 2010, 12:41 pm, in Wired … https://www.wired.com/2010/06/intron-origins/ .. This entry was posted in 06 – Monasic body / Higher mind body (Cosmic mind), All - Law of One - Ra, Ancestors, Bacteria, Co-creation of reality - New Creation, Council of Nine - sentient beings of our solar system (see also 'Star brothers and sisters'), Diet - herbs - extracts - aromatherapy, Free will - will power, History, Lower Mental Body - gut brain (see also 'desire elementals' and 'lower triangle' and 'vital body'), Mars - Martians - the Elder Race, Physical DNA – genetics, Power over - powerlessness - service to self - service to others, Protection - sanctuary, Saturn, Soul purpose - Soul mission - Soul evolution, Unity - oneness - harmony, War and peace - imprisonment and freedom and tagged aggression, All, Bacteria, catalysts to evolution, co-creation of reality, commensals, cosmic mind, Cro-magnon, disease as evolutionary catalyst, DNA, endosymbionts, free will, gender as evolutionary catalyst, genetics, gut brain, harmony, History, human body, human evolution, human-Martian alliance, Law of One, Mars aliens, Mars colonies, Martians, mobile group II introns, neanderthals, Peace, Ra, sanctuary, Service to Others, service to self, sexual dimorphism, social memory complex, soul evolution, space exploration, space station, star brethren, Star brothers and sisters, unity, War on 21 November 2016 by Alice B. Clagett. It is 10 October 2015 today. I am sitting up here in the Jemez Mountains of New Mexico. All I can see are pine trees everywhere, and the beautiful needles of the pine trees on the ground. And they make soft, silent footing. A light breeze is blowing. It is a beautiful, balming, fall day. [sighs] And here we are in the midst of incredible clearing for humankind. Incredibly beautiful clearing is going on. And we humans are doing what we may to facilitate the process. I have to say I am very impressed with humankind. The thing about millet is: You plant one seed, and when millet is a mature plant, there are all these seeds on one millet plant! And so millet is an example of fertility and fecundity, and feeding all of Earth; the prosperity of all the hearts on Earth … the happy growing, and the happy evolution of humankind. Anyway, I was going through fields and fields of millet seeds. And it feels to me like now like a millet seed would feel, if a farmer planted it in the field. And then the rains came, or else the irrigation system … whatever it takes. The water came, and softened the shell of the millet seed. And then grace told the millet seed that it was time to sprout and grow, yes? Imagine the turmoil there … the changes taking place inside of that seed, biochemically. Immense changes, as the seed starts to sprout, and bursts out of the hard shell, that has been softened by the rain … yes? … and begins, for the first time, to burst through the shell of soil above it, and begins to feel the sunlight, and begins to photosynthesize. Wow! That is just like humankind right now. We are going through immense changes internally. Everything looks the same; but we are going through metamorphosis. And it is like a butterfly … It is like when a caterpillar becomes encased in the pupal shell. And then all these changes take place inside, and everything gets mixed up. The whole structure of the caterpillar’s body gets changed. They call that … I do not much like the term, but they call that ‘pupal soup’. It is just like us right now, because humankind is about to burst forth into the sunlight, and is about to change from something that crawls on Earth, to something with beautiful wings, that can fly. These are the times! And we do what we do: We say Yes! I am willing to sprout. I am willing to burst through the soil. I am willing to feel the Sun upon my green leaves. I am willing to grow into a great millet plant with many seeds, that can help the whole world with wisdom and Light and grace. And we are saying: Yes! I am that caterpillar. I am willing to experience the pupal soup, so that I may become something that is far grander, and far more beautiful. So that I can remember the greatness that I am. And we humans, we are assenting. But what is actually making the change, I feel, is the Divine grace … the grace of God that lights our path and carries us forward, through the chaos, through the turmoil, through the sprouting of the seed, through the confusion of the pupal changes, and into the greatness of our Souls. God bless you all with love and Light and peace. God’s grace upon you! See also: Link: “Butterfly Soup!” http://lizhester.org/butterfly-soup/ .. This entry was posted in Anxiety - fear - panic attacks - fight or flight - cognitive dissonance - mental turmoil, Incoming light - grace - leveling up, Soul purpose - Soul mission - Soul evolution, Transformation - personal alchemy and tagged butterflies, caterpillars, clearing Earth, fertility, grace, human evolution, Jemez Mountains, light, mental chaos, mental turmoil, metamorphosis, millet, New Mexico, prosperity, pupa, pupae, sprouting seeds on 13 October 2015 by Alice B. Clagett. Astral Negative Shadows of People, or Astral Thuggees? This video is about how we humankind may choose to deal with regard to the fallen angels, the Satan world, and the rare few negatively aspected Wanderers. In it I backtrack to other astral experiences I have had over the years, ‘filling in the gaps’ a little so as to explain my recent clair experiences. In the video, there’s a little about the ascension of the planet Venus. What happened to the Souls that did not ascend with Venus? Are they here on Earth? Orange (sexual) energy on Earth. A little about the social memory complex known as Ra-En. Comparing these to the Service to Self beings now being encountered in 4D. ‘Newly hatched’ humankind. How the fallen angels, Satan, and the negatively aspected Wanderers are of help in human evolution. Our choices: Service to Self, or alignment with the Will, the Love, and the Mind of God. The photos for this video, along with others taken on that day, are posted here … Link: “Colorado Countryside,” photos by Alice B. Clagett … https://wp.me/p2Rkym-aSb ..
Looks what I found, Dear Ones: It’s a little, tiny bird shell, and it is pale blue. I wonder what kind of bird’s egg this could be? Is it a robin’s egg? I will find out … light as air. That baby robin, or whatever kind of bird it is, is around here somewhere, I will bet. Hello, Dear Ones, It’s Alice. My new nickname: I Am of the Stars. That could be my first name: Iam. And then maybe my last name could be: Ofthestars. It is a nice feeling, saying words like that, you know? I thought I would explain a little about a topic that I have been mulling over for years now, and that I touched on, in the past, from time to time. It is a little bit of a different topic, because people see it in different ways. The other day I spoke of the Demon World as if it were the Shadow aspect of our being. I think, in the main, that is true. And on the other hand, in humankind we have a myth … the myth of the Fallen Angels, I spoke in a previous blog about that, as something that is much more rare, here on Earth, than the Shadow side of our own Soul that we are reconciling and bringing into the Light right now. Today, instead of talking about the Shadow side of our own Soul, I thought I would talk a little about the Fallen Angels, and just pull together some strands of information that I have on that topic. I am not promising you that I will be 100 percent accurate on this; I am just offering the beginning if a direction of an investigation, or inquiry, into this. You can probably find out all kinds of information in your Bible about this as well … I found out all kinds of information Satan in the Bible; I think I posted that in a prior blog: The qualities of Satan. So, talking a little about what, in the Christian Bible is termed Satan, or in some myths is called the Fallen Angels … not so much from their point of view; but from our point of view, and how we might assert ourselves in relation to them. You could probably tell I am not totally looking forward to talking about it. You know, the Planet Venus ascended a long time ago … long before the fall of Earth, which happened about 120,000 years ago … before the fall of Earth to a lower dimension … from the beautiful energy that she had, to the lower energy of the third and fourth dimension … long, long before that … I forget: Was it billions of years? A long time before that, was the ascension of the Planet Venus. According to “The Law of One: The Ra Material,” the inhabitants of that planet learned their Soul lessons through love. And so, they perfected their Souls’ learning through love. It was what you would call the beautiful pink or emerald energy of the heart, that they perfected. The ascension happened over there … for the people on Venus; the beings on Venus. They had what they call a pretty good ‘harvest’. For them, that meant that some relatively small percentage [20 percent] of those people there ascended. There were quite a few who did not; so those Souls remained for further perfection. And in addition, on that world, were two beings who perfected their understanding of their Souls through the will power … through the center of Control, and through the color Orange [I think this may be a mistake in channeling, as the color for Control, at least on Earth, would be Yellow]. The Venutian Wanderers were 5D positive [blue, maybe close to peacock blue] … 89.33 … https://www.lawofone.info/results.php?s=89#33 … After their work on Venus as Wanderers, they harvested themselves from 3D negative (service-to-self). [yellow, but negative in aspect] … 89.34 … https://www.lawofone.info/results.php?s=89#34 … into 4D negative [green, but negative in aspect]. Then eventually they moved to 4D positive [green, and positively aspected] … 89.41 … https://www.lawofone.info/results.php?s=89#41 .. These two beings … reading between the lines … I think that they began a religious war on Venus that ended the lives of the people there who had not ascended … “Law of One” 89.31 … https://www.lawofone.info/results.php?s=89#31 ..
… because Souls go in flocks from one learning situation to the next learning situation. They may have come to Earth. And those two orange [should be ‘yellow’, I feel] may also have come to Earth … Or maybe two new Wanderers, as I have read that the two Venutian Wanderers, after much Soul work, retraced their Soul evolution to 3D positive. I read recently in the “Law of One” that there were about 60 million Wanderers on Earth as of 1981 … 63.10 … https://www.lawofone.info/results.php?s=63#10 ..
Link: “Quantitation of ASPs (Antisocial Personality Syndrome) Worldwide,” by Alice B. Clagett, 11 July 2018 … https://wp.me/p2Rkym-9Bo .. Here on Earth, there are so many different Souls … different kinds of Souls are here. I would like to just concentrate a little on what you might call the Orange energy [here I meant ‘Orange’ and not ‘Yellow’ … sexual chakra energy] here today, which is clearing, in batches and droves and massive amounts, from Earth right now. In the early days of my understanding and feeling of the ascension (about 17 years ago) I could sense the beings of the Satan world operating … especially in the large cities. And I could sometimes see them, with clair vision. The vision that I had was very Dark, and either very black, or very dark brown, and fiery red. The feeling that I got from them was very much the turning of the chakras to hatred … to distortion of energy, and like that. And they were very doubled up on people … There could be nine, working on one person’s Soul field in one night. The beings of the Satan world had some concerns, at that time, about what would become of them during ascension. I have no idea; all this is in the hands of God, the difficulty being those kinds of beings, such as what is termed the Orange [possibly ‘Yellow’?] entities from Venus … or the Satan world … or the Fallen Angels … Those beings have turned away from the great Power and Wisdom and Love of God … and turned toward the power of their own power center, the Third Chakra, in our human species. And so the power that they get … because they are not accessing the infinite Power of God … has to come from other beings. So there is a problem there; and that problem is that they desire power. And so they must take power from other beings, such as us. And we do not like that; we do not want them to do that. It is the kind of thing where the logic short-circuits itself. So, from their point of view, they cannot understand why we do not want to be dominated. And we … from our point of view … cannot figure out how they should think we would like to be. It is possible that the Souls from Venus … the Wanderers, the two Service-to-Self Orange [should be ‘Yellow’?) entities that were harvested there … and also, some portion of the Souls that were not harvested on Venus … or maybe all of them … may have come to Earth. The latter category (Souls not harvested on Venus) may have manifested as 3D/4D children on Earth. And some of them may be Spiritual Adepts … possibly also the two Orange [should be ‘Yellow’?] entities from Venus could be considered Spiritual Adepts … or two [should read 60 million or more … 63.10 … https://www.lawofone.info/results.php?s=63#10 ..] Wanderers not from Venus since, per the “Law of One,” there are always Wanderers who come to assist when a planet ascends … 89.39 … https://www.lawofone.info/results.php?s=89#39 .. I do not know what became of the Demon Realm … the Satan World, and all that stuff. If just does not seem to be there any more. What is manifesting right now is really, really different. They look like people; they are in the shape of people. But, as to whether they are the traveling astral form of people on Earth, or whether they are people who exist in astral form … I do not know enough about it to be able to say. Years ago, when I was driving across the eastern reaches of California, I encountered a whole flock of beings who call themselves ‘Ra-En’. They were fourth dimensional beings, and their beingness was Wisdom … the effort that they had … more like Alpha Centauri. They were what is called, in the “Law of One” a ‘social memory complex composed of quite a few ‘mind/body/spirit complexes’ … a gathering of those beings into a specific flocking of Souls in the fourth dimension. It is hard to explain; but apparently, there are batches of Souls that flock together in the fourth dimension. Some, like these ‘Ra-En’, are really very interesting entities. If you can imagine the Theosophical Society suddenly segueing into the fourth dimension, and having a million extra years of Soul learning experience, then they might become something like Ra-En, I feel. Ra-En is just a very copacetic utopian group. Let’s compare Ra-En to these very different folks [Shadow aspects of people, in astral form? Astral thuggees without physical form?] that are hanging out in the mid-fourth dimension, the mid-astral plane, right now. They seem like people. They are shaped like people. They are eminently logical, highly persuasive, diplomatic, intent on their own purpose. And that purpose is to dominate and control humans. And here we humans are … fledglings of God, coming into the flowering-open awareness of the glory of God; the wonders of aligning with God. And we are full of trepidation, as if we were in an egg … a little, sparrow’s egg … and we have been trying to get out. You know how little birds do? … They peck and peck, to get out of the egg. First their nose and their beak comes out, And then they stop … they are tired, in there. And then they start up again. And finally, by hook or by crook, they get themselves out of the egg. And they are really exhausted; they just lie there for a minute or two, breathing rapidly. It makes me want to pick them up and take care of them, they are so cute. This is the wonderful love of God waiting for us to relate to it. So, at that moment … this moment Now … what is happening is that these other beings, which have a different sort of orientation from us … It is really a funny little play: They are scooping around on the astral plane, and they see us. And they see a bunch of equipment that we do not know how to operate yet … Just like a baby chicken does not know how to flap its wings … It has not grown its feathers yet … It is just waiting around for a chance to grow up, right? VIdeo: “Our Chickens Hatching! !,” by Fun Kiwi Kids, 22 October 2011 … https://www.youtube.com/watch?v=k3N5vtauDQU ..
And the very tiny baby chicken, just out of the egg, is just learning how to open its eyes and sit up straight too. And we are like that … These beings are coming around in droves … very suave, very sophisticated, very intent on their own purpose … saying ..
You are really here for us to direct. You are really here for us to explain things to you. We will explain all about what you should do. And so, they are saying: Just let me get into your cockpit! Image: “V-Shaped Wedge Entity Insert: Manning the Cockpit,” compiled by Alice B. Clagett, 19 November 2018, CC BY-SA 4.0 … adapted from “The Mona Lisa” by Leonardo da Vinci, between 1503 and 1505, from Wikipedia, public domain … from “I Am of the Stars,” https://iamofthestars.com/ ..
Maybe they have been doing this all along, without us knowing about it! And they are superior intellectually. Mama hens, even though they are pretty small and defenseless themselves, can be very, very helpful to their babies. They can be very fierce when it is a matter of helping out their babies. So the mama hen comes around, and she looks at these little flies, and she just kind of settles herself over the baby, and keeps it warm, and fluffs up her feathers, and like that. And then the baby chicken knows it is not those little flies that are the ones; it is the momma hen. It is all the love of the Mother. So now I would like to say to you: If you experience this (i.e., a V-shaped insert by a hostile astral entity), all you have to say is: I align my mind and heart and will with those of God. And then they have to leave. You can say: Disengage the group subprogram. And then they have to leave. Because what has happened is: As Earth has descended into the third and fourth dimensions, our etheric nets have taken on some distortions … some infoldings and wrinkles and convolutions … that have allowed them to make adjustments in our hologrammatic programming that accommodate their energy. And we are mostly unaware of that. So I say: The first thing to do is to relate to one’s own power of God: The power of God within us. For your own good, I will send you off to war. For your own good, there’ll be no laughter any more. For your own good, I call your girls whore. For your own good, I call me Robin Hood. I could go on for a long time about that notion that something that hurts us is for our own good, but I will not do that today. I would only say, that if it hurts us, it is never for our own good. What opens our heart, and heals our Soul wounding: That is for our own good. So now: When our hearts are open, we may say to ourselves: What will become of these beings? That is not really up to us. That is up to God. Their Soul evolution (or maybe I should say social memory complex evolution) is proceeding so differently from ours, that the answers lie with God, and not with us. The only argument that I found persuasive, in this case, is to say that the central power switch for their beingness is located in their heart. And this is true. Whether they will choose to switch their hearts on, or not switch them on, is completely up to them. And there will be a place for them, in the evolution of many Souls (or maybe I should say social memory complexes) if they delay indefinitely; for the helpfulness, in God’s plan, of the Fallen Angels and the Satan World and the Orange (perhaps negative Yellow?) beings is to test us … constantly test us … until we develop our own will power and our own understanding of our magnificence … until we get the notion … like the little baby chicken, just lying there, does not know all the many things it can really do. It does not know how to walk. It does not know how to eat. It does not know it has a mom. It does not know it can even open its eyes. It is just lying there, really exhausted … just breathing deeply and glad that it is out of the shell. You know? And that is us. We have a lot to learn. And so, when they come round, what they are really teaching us is: Whether we will relate to the God in us, or whether we will relate to our own mental minds, our own Ego, and our own will power. Which is the thing that we will choose? Which is the thing that will open up the true greatness in our Souls? You all take care. Lots of love. Link: “Merging Polarities: The Shadow, Gender Roles, The ‘Evil Twin Flame’” by Alice B. Clagett, 26 June 2015 … http://wp.me/p2Rkym-3py ..
Link: “The Time before the Times,” a vision by Alice B. Clagett, 8 April 2015, http://wp.me/p2Rkym-34s ..
Link: “Fallen Angels and the Buddhist Metta Prayer,” by Alice B. Clagett, Filmed on 10 June 2015 .. http://wp.me/p2Rkym-3n9 ..
Link: “Characteristics of Satan,” by David Buck, 7 May 2010, http://studygodorg.blogspot.com/2011/04/characteristics-of-satan-by-david-buck.html ..
Link: “A Hathor Message: How the Venutian Wanderers’ Karma Has Been Resolved during Earth’s Ascension” by Alice B. Clagett, 29 June 2015 … http://wp.me/p2Rkym-6Kq ..
Link: “Ra-En,” by Alice B. Clagett, 26 September 2015 … http://wp.me/p2Rkym-W2 ..
LInk: “What to Do about Walk-In Attempts,” by Alice B. Clagett, 29 June 2015 … http://wp.me/p2Rkym-6Kw ..
LInk: “Activations of Light to Deactivate Telepathic Groupings and Eighth Chakra ‘Bow Ties’” by Alice B. Clagett, https://wp.me/p2Rkym-6KK ..
Link: “The Law of One: The Ra Material,” Question-Answers 12:26-31 … https://www.lawofone.info/results.php?s=12#26 ..
Link: ‘Wanderers’ search at “The Law of One: The Ra Material,” … https://www.lawofone.info/results.php?q=Wanderers .. This entry was posted in Aligning with God - dharma - right action, All - Law of One - Ra, Alpha Centauri, Bible, Christianity, Couples tantra - twin flame, Demonic realm, Drawings by Alice, Fallen angels, Obsession - possession - entity attachment - exorcism, Pass-through or flow-through, Power over - powerlessness - service to self - service to others, Satan - Satanism, School of Theosophy, Shadow of our personality - dweller on the threshold, Skinny dipping (Soul signature dipping), Stories - myths - visions - legends, Tantra, Venus, ZZ- Awakening with Planet Earth and tagged aligning with God, All, Alpha Centauri, ascension of Venus, astral planes, Bible, Christianity, Demonic realm, Drawings by Alice, Fallen angels, flow-through, for your own good, Hathors (see also 'All - Law of One - Ra'), heart energy, human evolution, Law of One, myths, Orange Beings, pass-through, Ra, Ra-En, service to self, shadow of the personality, social memory complexes, stories, Theosophical Society, Wanderers on 1 July 2015 by Alice B. Clagett. Or it could be that both experiences … the experience of being at the effect of Spiritual Ego AND the experience of my own jump to a higher energy state, simply COEXIST, in the same instant, as causal and synchronous reality. Possibly my receiving negatively aspected telepathic input may CAUSE my jumping in awareness to a higher dimension, a higher energy state. Recent kinesthetic experience of another person’s electromagnetic field transposed into my own. Ego and the sense of physical separation; of ‘I’ and ‘other’. Third dimensional (3D) Ego compared to fifth dimensional (5D) Ego. Spiritual Ego as third chakra negative. Issues of status and prestige in Spiritual Ego. Issues of protecting, guiding, enlightening, and spiritually teaching other people during the Awakening. Issues of ‘power over’ and powerlessness. Glass ceiling ‘above’ Spiritual Ego as survival instinct. Relaxation of the diaphragm to allow pranic column energy to rise to heart. Aligning my intention with God’s Will. God’s will delegated to my celestial Ascension Team. Art of listening to God, and to my celestial Ascension Team. This video has a main part, followed by a sky photo, followed by a concluding comment. There is a lightly edited Summary after the video .. I have heard it said that Spiritual Ego is a kind of a glass ceiling that we run into, as we pursue the path of Evolution, on the human scale. And it stands between our human selves, and our life and understanding and awareness as a Spiritual Adept. It seems we reach a certain point in our studies and practice of the presence of God, and at that point, from the egoic point of view, we might consider ourselves to be head and shoulders over the crowd of humankind … because we have studied a lot. And we know quite a few answers about God and about reality, and all that stuff. So first, let us go back to the notion of Ego; because, you know, we are dealing, this year, with the third chakra negative. We have talked quite a bit about the aspects of third chakra negative known as ‘power over others’ and ‘powerlessness’ … sometimes termed the ‘Controllers’ and the ‘enslaved’, which is rather more dramatic. So that is one aspect of the third chakra that is changing … It is not really the chakra that is changing, but rather, the awareness of the energy is changing, so that it is becoming more conscious. And we are having a chance to understand the truth of the third chakra, and the wonders of it. Another aspect of the third chakra … as I have read; as I understand it … is Ego. Ego is a very necessary mental filter, through which we are able to function as human beings in human bodies on Earth … as Individuals in the Third Dimension. From my encounters with the Fifth Dimensional Hathors, I would say there is also Ego in the Fifth Dimension … but nothing like Ego here in the Third Dimension. Rather, it is like an understanding that individuality exists, and that there are slight differences in the fabric of the mental-emotional-spiritual makeup of individuals; but not a strong sense of separation anymore. In fact, it is the exact opposite. In the Fifth Dimension, and on up, there is a sense of Unity, of Oneness, and an appreciation of small differences of personality, expressed as Ego. But here in the Third Dimension, there is a real problem with the notion of separation. It is that notion of separation which created the illusion of the Third Dimension in the physical world in the beginning … because it seems very clear, through the construct of the senses of mankind, that there is such a thing as me … and there is such an unflowing, unchanging, and opposing thing as Other. Whereas, in a more refined energetic state, it is much easier to imagine flowing through, and into, and becoming different, and joining, at a molecular level … at a quark level, uniting with the energy of another individual, and then withdrawing from that energy just as easily. The flow of the Fifth Dimension makes a flow out of Ego, as well. But here on Earth, it is as if our Ego were something that physically protects us from joining with the energy of the Earth and the Sky, and of other humans, and animals, and the trees … My Ego makes me a thing. So, what about Spiritual Ego? My Spiritual Ego makes me … hierarchically speaking … a pretty important thing. And that is kind of a hard thing to let go of, after a lot of work. That is what I think. And also, it has great value, here on Earth right now. When a lot of people are wondering what it coming up next, and leadership is needed … or considered to be needed, then there a lot of people who look to a person with Spiritual Ego, as providing an umbrella of protection. So there is a Spiritual Ego, like that … [shows cupped hand, upside down, fingers slightly spread apart] … and beneath it … [wiggles fingers] … are the people; the people who feel they are actually part of and connected to the Spiritual Ego of group leader. And this holds for huge religions such as the Catholic Church, with the Pope in charge, and the College of Cardinals around him, and the Archbishops and Bishops, on a more local level … and it also holds for smaller groups as well. Pros: Status and Prestige; Compassionate Protectiveness and Guidance. So one of the the perceived values of Spiritual Ego is status or prestige. And those are personal values, or ‘perks’, of Spiritual Ego. A more compassionate value of Spiritual Ego is the chance to protect other people … to guide them, and like that. Cons: ‘Power Over’ of the Leader, and Relative Powerlessness of the Group. So those are pros. And then, on the con side … in other words, the part of Spiritual Ego that is troublesome, these days, the leader … [shows cupped hand, upside down, fingers slightly spread apart] … Imagine he is the very top of this umbrella. And at the top of the umbrella, right at the top, the leader is sitting, like the knuckle on my cupped hand. And he, through his mental-emotional-spiritual process is connected to all the … [wiggles fingers] … Imagine the fingertips are the other people in the group; a group of five people, and the leader. So, in the leader’s mind is always the mental construct of an umbrella, and that he is the top of the umbrella, and that he is sending out protection energy, and enlightenment energy, and spiritual energy to everybody in the group. So in a sense, under the auspices of Spiritual Ego, the leader is the group. And what does the group do, when this happens? The group cedes power to the leader. He has ‘power over’; they are relatively powerless. So there is ‘trouble in the ‘hood’, in this regard, and the trouble is that the people have a notion that they have no power, and the leader has a notion that he is everyone in the group. Is that not something? Is that not an amazing construct? Is that not an amazing mental filter? Now I am going to tell you a story about last night. The most amazing things have been happening to me in the middle of the night. I will wake up from a deep sleep suddenly … at 2 a.m., 3 a.m. … some time around that time … and something most amazing is happening. So I sit up. I get up and I go meditate for a while, and even more amazing things unfold. I had to check on my cat just now; she has been making the most peculiar sounds lately. And this was the most peculiar yet. It was almost like she was singing the Song of the Wild. Sometimes, when she drinks water from her water bowl, she makes this call several times. And I wonder if I really have a black, American short-haired cat? … or maybe I have a tiny wild panther, in my house! … [laughs] … So anyway, she made a series of calls just now. And I checked to make sure she was ok. And there she was, sitting very placidly on the rug. So I do not know! These are interesting times! To get back to what happened this morning … early, early in the morning … way before dawn, I could feel the diaphragm, the front funnel of my heart chakra, contracting and expanding. And through it was coming a sound … a human voice sound. And one of the first things that it did, was to voice an upset or complaint, like a reprimand against somebody that I knew, who had certain personality characteristics … behavior characteristics … that had been setting my nerves on edge, from time to time … very rarely, but once in a while. I am of a generation that does not like to talk about those kinds of upsets. So what I heard, was something like a masculine voice offering a reprimand that was truthful but stern, to someone that I had not cared to offer a reprimand to. And the result was that this other telepathic participant, this person whose behavior had been setting my nerves on edge felt chided, and taken aback, and kind of upset. Because it is possible that I accessed a deeper level of heart awareness, and then was ready to say something that before, I was not ready to say … something perhaps more truthful. And also, the possibility exists that this event could be viewed on two separate levels of Reality, in two different Dimensions, one being the Truth that I just spoke of, and the other being the Truth of someone else, who has a Spiritual Ego, and who wishes to control. Or maybe my receiving negatively aspected telepathic input may in some way cause my jumping to a higher Dimension … a higher energy state. Just taking it from the standpoint of the Third Chakra negative: Were it so, that what happened was a Pass-Through or Flow-Through my heart by another person, what you would have, is the attempt of somebody who has not yet succeeded in breaking through this glass ceiling of the Third Chakra … which sometimes can be broken through by relaxing the muscles of the diaphragm, which are just at the bottom of the lungs. Beneath the lungs, just at the bottom of the rib cage, there are muscles that go through the whole body, that can be relaxed. And when they are relaxed, then the pranic energy can pierce through the resistance there. The resistance has to do with breathing and staying alive, you know? So it can feel pretty insistent. So that goes to show how a person, who is actively seeking to escape from Spiritual Ego, but who has not yet succeed in doing so, can venture into territory that might appear to another person to be an invasion of privacy, an invasion of the aura, and so forth … without actually intending harm, but instead, intending what you might call, to do something for someone else’s ‘own good’. The problem is that, in the Now .. in the Fifth Dimension, we must make very certain, always, to ask first, and to make sure that the free will of another person agrees completely with any help that we might like to give. So it is not a question of ‘owning’ the people under your umbrella. It is a question of asking … at this moment, and every moment in the Now: Is my help needed? … and … Is my help desired? We all want to help. But we must respect free will, or nothing good will come of our desire to help other people. And so, at the same time, on another level … from the level of the heart chakra … even if there may be perceived interference, on that level, from someone with third chakra negative … from my own point of view, I can see, and I can understand the Hand of God in what is happening, because it is God who makes changes in my heart. It is God who directs the show, and God who loves me, and has only my very highest good in mind. My Soul, day to day, I align with the intentions of my Creator. And so, I hope to act, in the world today, in synchrony with the Will of God. That is my hope. That is why I do not pay too much attention to what people tell me. I always look to God, you know? … because I figure things are changing so fast! And only God knows for sure. And He delegates to my 5D-6D Ascension Team all the time, you know? They have an idea what is going on. The truth of the matter is: I do not have one idea! But I trust that it will be ok. And I am certain that it will be ok for each of us … very certain we will all be ok.
Link: “Groups and ‘Acting Out’ during This Transitional Ascension Phase,” by Alice B. Clagett, 14 March 2016, http://wp.me/p2Rkym-4ZP .. This entry was posted in 3rd chakra - navel point, 3rd Dimension, 4th chakra - heart chakra, 5th Dimension, Advaita - nonduality - duality, Aligning with God - dharma - right action, Ascension team, Astrogeophysics - EMF - hologram, Christianity, Clair senses, Controllers, Dark Attacks, Dimensions - multidimensionality - veils, Ego - higher self, Free will - will power, Grouping - leadership, Hathors (see also 'All - Law of One - Ra'), Mental filters, Pass-through or flow-through, Power over - powerlessness - service to self - service to others, Psychic powers, Spiritual adepts, Star brothers and sisters - exobiology (see also 'Council of Nine'), Stories - myths - visions - legends, Stories by Alice, Unity - oneness - harmony, Yoga and tagged 3D ego, 5D ego, 5D flow, advaita, aligning with God's will, ascension team, Catholic Church, causal versus synchronous reality, Controllers, Dark Attack, EMF transposition, flow-through, for your own good, fourth chakra, fractal alignment of two people's electromagnetic fields, free will, group mental filter, group umbrella, grouping, groups, heart chakra telepathy, heart energy, human evolution, I and other, individuality in the fifth dimension, leadership, Mental filters, oneness, pass-through, personality, power over, powerlessness, practice of the presence of God, pranic column energy, relaxing the diaphragm, separation from others, spiritual adept, spiritual ego, spiritual teaching, Star brothers and sisters, status, stories, Stories by Alice, telepathic chatter, third chakra negative, third dimension, true third chakra, unity on 28 January 2015 by Alice B. Clagett.